I am pretty lucky in having a sister close in age that I get on so well with. Although we both left home when we were 16 for boarding school and haven’t lived in the same country for years (the last time was in 2009 when I spent 6 months in Brussels for work, before that it was in 2000 when our time at boarding school briefly overlapped), we are still incredibly close. And while we may not speak everyday, we have developed a nice rhythm over the years of paying each other regular visits – Helena often came down to London from Bath during our student days, she showed me ‘her’ Paris when studying for her Masters there (which mainly involved us gorging on Pierre Herme macarons! ), I hopped on the late night TGV from Paris to Geneva to spend my 21st birthday with her when I was interning in France and she was interning in Switzerland, I spent many weekends after business trips to Brussels staying with her while she lived in Brussels, going for a run with her around the park by her flat, going out with her and her friends at night or sitting on the sofa, drinking wine and ordering pizza, and now that I live in Rome, she comes to see me here and I go over to see her in London where she started a new job earlier this year. I like our weekends. Helena is one of the most easy-going people I know. At the same time, she is also frank – she knows what she wants to do and see and will also tell you right away if she is exhausted and would rather spend some quality time on the sofa after a busy week at work instead of going on a sightseeing marathon. It also helps that we share many of the same interests. Invariably our visits include some trips to museums or exhibitions, some retail therapy, some good food, plenty of coffee breaks, a glass of wine or two, and lots of long conversations. Helena came to Rome again a few weeks ago. 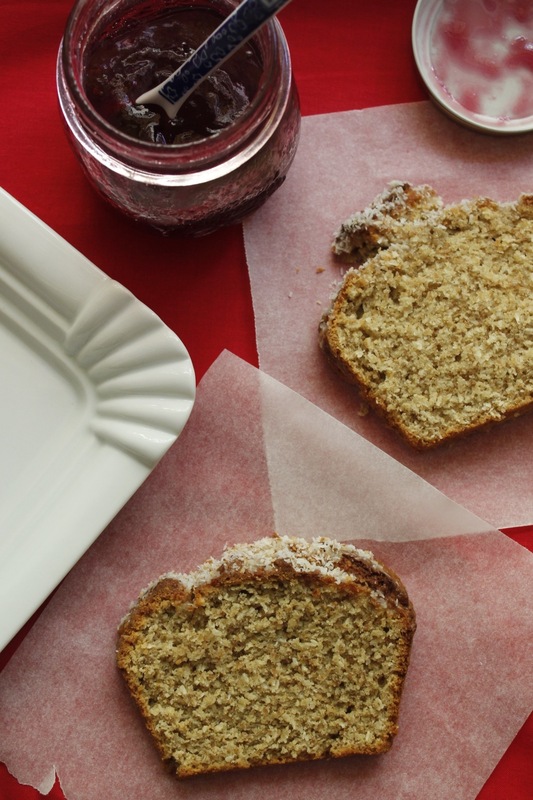 Knowing we might not feel like getting dressed and head to a cafe for breakfast first thing in the morning, I wanted to bake something to have on hand in case we preferred sitting on the sofa in our PJs for just a little bit longer. It was Alessandro who requested I make the coconut loaf from the Sprouted Kitchen cookbook. And having just made some Lamingtons, I happened to have the exact amount of shredded coconut required by the recipe. I was sceptical about the addition of fresh nutmeg, a spice that does not feature heavily in German recipes, but as Sara’s recipes have never failed me, I decided to just go for it. And what can I tell you, the combination of coconut and nutmeg is absolutely wonderful. 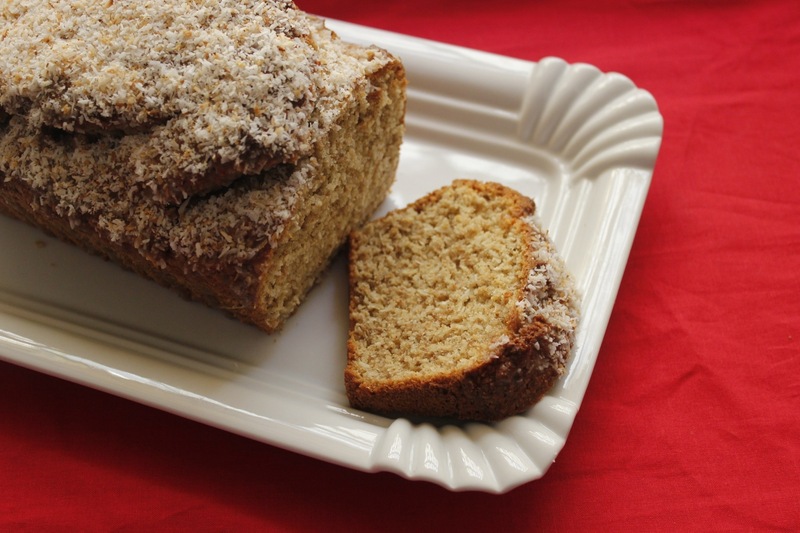 As she writes in the book, the coconut flavour of the loaf is fairly subtle, although noticeable, and I would agree with that, but the nutmeg brings out the delicious sweetness of the coconut and adds this warming note that makes me think of cold autumn days and starting the day with a steaming mug of tea and that is just perfect. Note: I made a few changes to the recipe in the book, using sunflower oil as I was out of coconut oil, substituting a mix of milk and yoghurt for the coconut milk, using a little less sugar and making my own glaze. I also converted the recipe into metric measurements. We ate most of the loaf plain but after my sister left I had a few slices toasted and spread one with some homemade grape jelly and another slice with some coconut jam and that was delicious too. 1. Pre-heat the oven to 180 degrees Celsius and grease a loaf pan with a little butter or oil and set aside. 2. Dump the dry ingredients (using 150g of coconut only, leaving the remaining 50g to scatter over the baked loaf) into a bowl and stir together. 3. Whisk together the wet ingredients and pour over the dry ingredients. Stir everything together quickly – you should end up with a fairly thick batter. 4. Pour the batter into the loaf pan and place in the oven for 45-50 minutes or until the loaf is light brown and a toothpick inserted into the centre of the loaf comes out clean. 5. Leave to cool in the loaf pan for ca. 5 minutes before carefully inverting the loaf on a drying rack. 6. Whisk together the sugar and malted milk powder with just enough water or milk to achieve a pouring consistency. 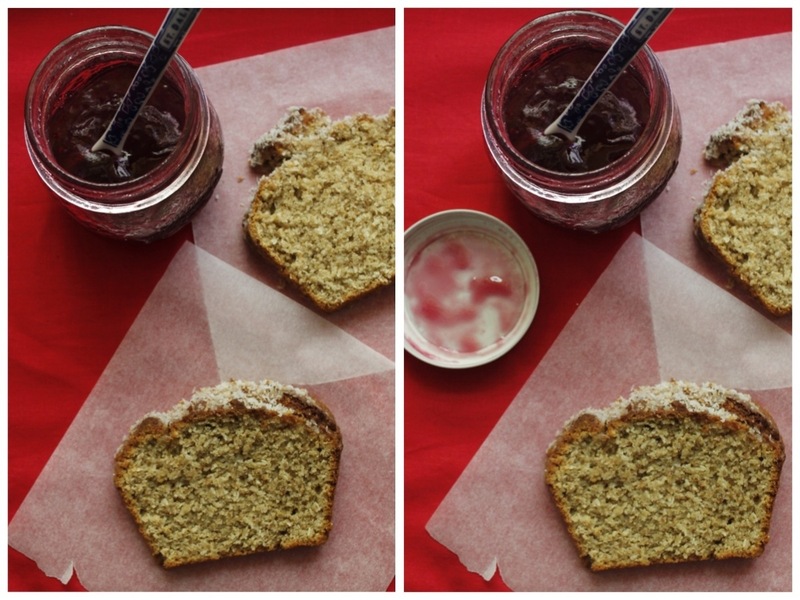 Drizzle the glaze over the still warm loaf and scatter the remaining 50g coconut over the loaf.